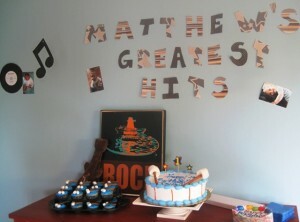 The party room was decorated with music notes suspended from the ceiling, as well as hand constructed “singles records” representing each month of the past year, with an appropriate picture matching each song title. 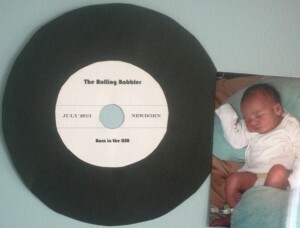 Newborn – “Born in the USA” . 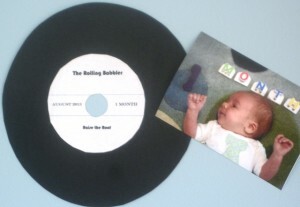 One Month Old – “Raise the Roof”. 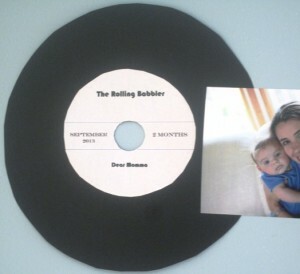 Two Months Old – “Dear Momma”. 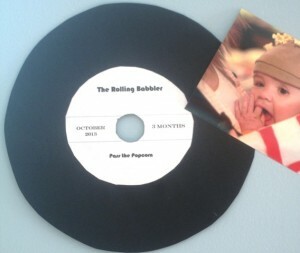 Three Months Old – “Pass the Popcorn”. 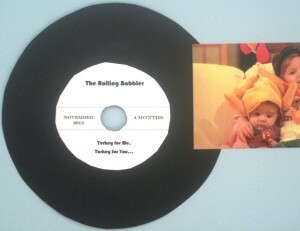 Four Months Old – “Turkey for me, Turkey for You” . Five Months Old – “All I want for Christmas is My Two Front Teeth”. 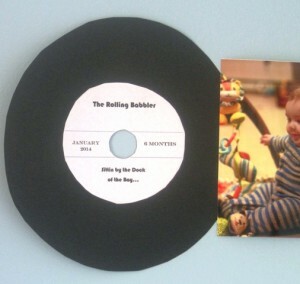 Six Months Old – “Sittin by the Dock of the Bay”. 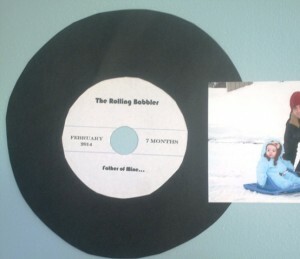 Seven Months Old – “Father of Mine”. 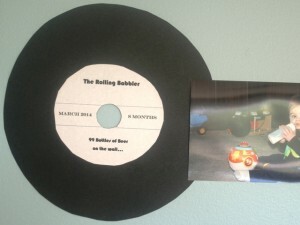 Eight Months Old – “99 Bottles of Beer On the Wall”. 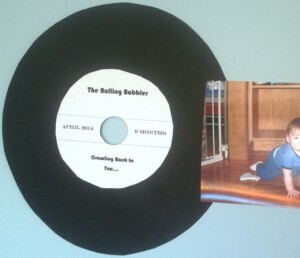 Nine Months Old – “Crawling Back to You”. 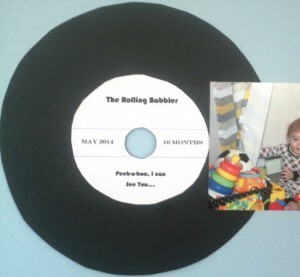 Ten Months Old – “Peek-a-boo, I can see You”. Even Months Old – “These Boots are Made for Walking”. 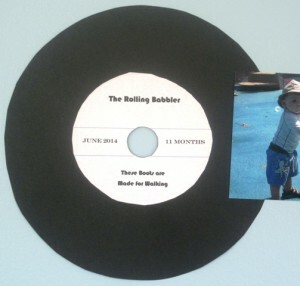 Twelve Months Old – “Go Shorty, It’s Ya Birthday”. This view displays the wall decor, and some of the music notes dangling from the ceiling, and the beautifully handcrafted banner at the cake display corner. 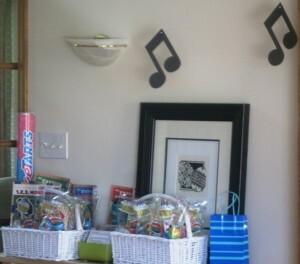 Party Favors displayed here consist of a individual bags filled with age appropriate goodies, plus a homemade CD. 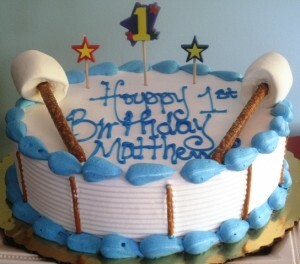 The proud and talented mom of the Birthday Boy, improvised the decor of the Birthday Cake, transforming it into a drum. She used small pretzel sticks to form the sides of the drum, plus two Huge Campfire Marshmallows pierced by large pretzel sticks, turning them into drum sticks. 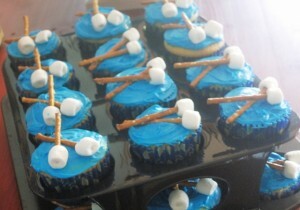 She also baked cupcakes, and decorated them with little drum sticks made out of small pretzel sticks and mini marshmallows. Pretty cleaver; wouldn’t you agree? 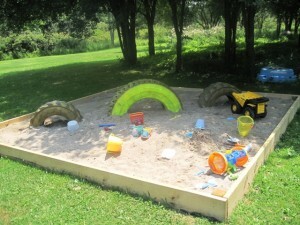 The handy daddy of the Birthday Boy, constructed this over-sized sandbox. Someone actually referred to it as the “backyard beach”, which was filled with happy kids, during the outdoor activity time. 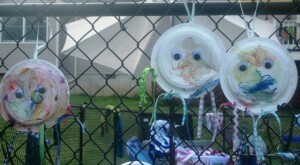 The other craft the children enjoyed, was making their personal tambourines. 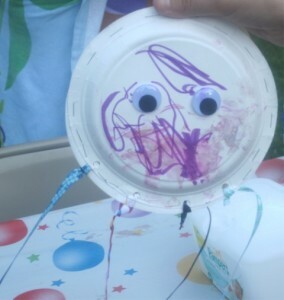 This craft required two paper plates stapled together to form a pocket, then filled with some dry beans, stapled some more to close up the pocket. 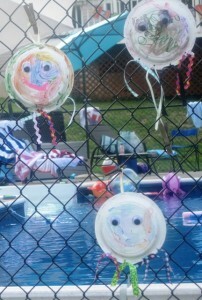 Then decorated with googly eyes, ribbons, and finally colored with paints or markers. 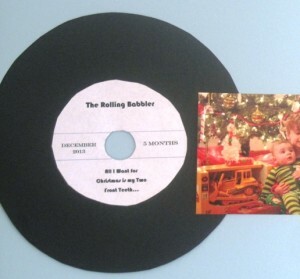 The age of these “artists” ranged from 1 – 6 years old….soooo cute. Lunch and cake were served outdoors, to accommodate the kids and parents to an easy access to the sand box, playground, and the baby pool. 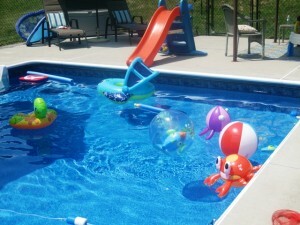 After the numerous fun activities, everyone was ready to cool off in the pool. 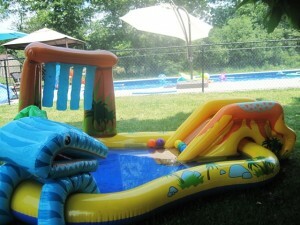 The tired out parents enthusiastically welcomed the idea, and enjoyed it even more than the little ones. 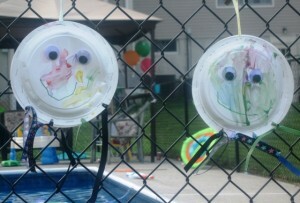 It was a great party, and the weather was very cooperative as well.